NYC, 02/12/2019, 5:30PM. 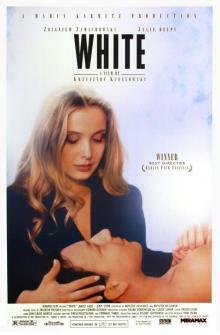 Three Colors: White (1994): Second of the trilogy by Kieslowski. Starring Zbigniew Zamachowski, Julie Delpy, Janusz Gajos. White is the second in the Three Colours trilogy, themed on the French Revolutionary ideals, following Blue and preceding Red. The film was selected as the Polish entry for the Best Foreign Language Film at the 67th Academy Awards, but was not accepted as a nominee. Kieślowski won the Silver Bear for Best Director at the 44th Berlin International Film Festival in 1994.